Thoughts and Stories from the front lines of advanced surface engineering. How Strong Should a Radiant Barrier Be? Some radiant barrier applications require the radiant barrier to have more strength than others. For example, laying the radiant barrier over the joists on the attic floor requires very little strength since this application typically doesn’t even require the radiant barrier to be fastened or attached to the joists in any way. On the other hand, stapling or nailing the radiant barrier to the underside of the roof rafters or in between the roof trusses requires that the material not only hold staples but also be able to be pulled tight without ripping or tearing during the install. With so many aluminum radiant barrier products looking so similar, some manufacturers choose to differentiate their products on strength. In a sort of “space race” to advertise their stronger and stronger products, if one manufacturer calls their product “Heavy Weight” the next manufacturer may call theirs “Heavy Duty” and if one manufacturer says their radiant barrier is “Professional Grade” the next manufacturer may call theirs “Industrial Grade”. In fact, one manufacturer in particular has their high-strength radiant barrier grommeted, printed, and made into a “Sport Utility Blanket” for everything from emergency shelters to ground tarps. 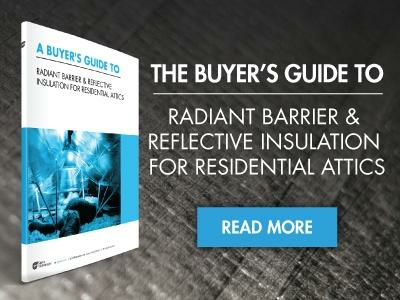 So how are manufacturers able to make their radiant barriers stronger? The conventional way these radiant barriers are made is by laminating an aluminum foil or metalized film to a plastic fabric or scrim. Naturally there’s a correlation between the thickness and weight of the reinforcement and it’s strength. However, there are cheaper and easier ways to make the product thicker and heavier without improving the reinforcement, like adding thicker glues, sealants, or even manipulating the cardboard cores the radiant barrier is rolled onto. For this reason, heavier weight does not necessarily equate to higher strength. Just looking at the weight and thickness doesn’t give you the full picture. For example, Sigma Technologies makes their radiant barrier a bit different. Instead of laminating, Sigma directly metalizes the woven fabric directly. This skips the glues, sealants, foils, and films entirely, reducing weight and waste without sacrificing strength. So if weight isn’t the best means to determine strength, what is? Well, there are two ASTM methods that are appropriate for radiant barrier products. The first is ASTM D2261, which is a Tongue Tear test. This is the strength test specifically called out in ASTM C1313, the Standard Specs for Sheet Radiant Barriers. Essentially, this test initiates a tear and pulls the material to propagate the tear, determining how much pressure is required to tear the product 3 inches. The test is run in both the Machine Direction and the Cross Direction (or Warp and Weft). Weaker radiant barrier products may only register a strength of about 2 to 3 units of pound-force, while stronger products may see numbers as high as 10 to 15. The second test method used to measure strength is ASTM D4533. The biggest difference between ASTM D2261 and ASTM D4533 is that D4533 controls the direction of the tear by aligning it with a trapezoid, holding and pulling the tear along a guide, ensuring more threads in the reinforcement actually tear. A non-laminated product like Sigma’s Thermflux 3100 Series radiant barrier tends to stretch when pulled, and the tear may reach the 3 inch requirement with little to no threads actually breaking, giving it a deceptively low result. The stretching of the initial cut, in fact, may actually tighten the threads below it. Because this product behaves differently, testing all the products to ASTM D4533 would be more apples-to-apples comparison. Sigma’s Thermflux 3100 Series scores about the same as other high-strength woven products when tested to ASTM D2261, but scores the highest by far when tested to the ASTM D4533, whereas a thicker and heavier laminated competitor’s product that scored nearly the same in the Tongue Tear test actually scored much lower in the Trapezoid Tear test. While this competitor’s product appeared on par with Sigma’s Thermflux 3100 Series radiant barrier in the ASTM D2261 test, the ASTM D4533 test shows that the Sigma product is nearly 2X stronger in the cross direction and about 3X stronger in the machine direction. Of course these are not the only tests for strength. Some manufacturers, distributors and resellers show off their products’ strength by doing less scientific demonstrations, like cutting into the material with scissors and having a potential customer try to tear it further by hand. Others may do things a bit more dramatic, like tie it to the back of a trailer hitch and pull it, or suspend it in the air and have grown men stand on it. It’s easy to be impressed with high strength products, but it’s important to remember their intended use, which is to just hold staples. Most applications need to focus on other factors and do not require high strength, but just need the product to not tear easily during the installation process. In fact, an over-engineered product may actually make the product MORE difficult to handle and install if it is significantly bulkier and heavier. Consider the application before buying. Condensation forms when two different temperatures meet on a single surface. Since warmer air holds more humidity than colder air, when the warm air meets the cold surface, the humidity condenses into small droplets of water. In a metal building, condensation may just result in water annoyingly dripping down from the ceiling, but in a home, the last thing you want is water condensing and getting trapped in the ceiling or walls, which could potentially lead to mold or mildew if the moisture doesn’t escape. The only difference between a radiant barrier and a reflective insulation is that a reflective insulation has an R-value. The R-value is achieved by having the low-emissivity, high-reflectivity surface face into a dead air space. While some products also have a layer of insulation laminated to a low-e surface, that insulation layer is typically just an R-1, so even those products still rely on the dead air space. Radiant barrier type insulation relies solely on its low emissivity to insulate, providing no resistance to convection or conduction. As a result, anything that might affect the radiant barrier’s emissivity, like metal corrosion, should be a primary consideration in purchasing a product. Emissivity is expressed as a percent indicating how much infrared radiant heat is allowed to “emit” from it, as opposed to reflecting off it. Simply speaking, emissivity represents the percentage of infrared radiant heat a product absorbs and emits rather than reflects. It is represented as a number between 0 and 1, or as a percentage. As we explain in an earlier blog post, surface emissivity of insulation can play a significant role in the insulation’s efficiency because the lower the emissivity of the outer surface, the lower the percentage of radiant heat the insulation allows to “emit” though. In residential and commercial construction, a radiant barrier uses just a low emissivity surface to provide all of its insulation. The primary performance characteristics, like surface emissivity, corrosion resistance, breathability and even the strength of radiant barriers can change, batch-to-batch and run-to-run during manufacturing. Products need to be tested and retested to make sure they are meeting spec, especially if you’re marketing or advertising a certain quality or performance. At its core, industrial insulation is the same as the insulation in your attic at home. It reduces transfer of heat to make a space more comfortable and cost less to maintain. Whether it protects against heat, reduces sound transfer, or protects against specific electromagnetic frequencies, industrial insulation works via the same basic principles. That said, the wider variety of tasks and environments for industrial application make industrial insulation more flexible, come in more varieties, and honestly more interesting than the fiberglass batting that’s over your head right now. Heat can transfer in three ways: Conduction, Convection and Radiation. Different applications of insulation rely more heavily on one method of heat transfer than on others. Convection, for example, doesn’t exist in a vacuum so only conduction and radiation remain. Multi-layer insulation spaces heat-reflective insulation material across air space. This minimizes conduction because of the space between layers, and each layer minimized radiation by reflecting back 95% to 98% of infrared radiation. Heat reflectors are any material that reflects infrared radiation away from itself rather than absorbing and emitting it. You see this in daily life when you choose to sit on a white bench instead of a black bench on a sunny day. Technological and industrial insulation applications are sensitive to far finer temperature differentials than your rear end. Off the rack insulation products are useful in many consumer applications because they are often designed to a specific standard or end use. The most common example of this is wall insulation for residential and commercial buildings, which are produced in widths that match standard code for wall stud spacing. With industrial applications, the flexibility of custom production gives manufacturers a competitive and economic advantage. Surface emissivity is the amount of infrared energy emitted by a specific material. It is often expressed as a ratio or percentage of “1” with the “1.0” value being perfect “black body”. A material that emitted heat energy at half that rate, like polyester film, would have a rating of .50 or 50%. Objects like aluminum or copper, with low surface emissivity (low-e) do not transmit heat well because most of the infrared energy is reflected instead of absorbed.